There are women who are STANDING for their marriages. Yes, they are married to disobedient, unfaithful, and difficult husbands but they understand the cost and are willing to obey God instead of listening to those around them encouraging them to take the “easy” way out and get divorced. Several women in the chat room are standing strong in the gap for their husband’s soul and their marriages even though many have told them to divorce their husbands. It is a beautiful thing to witness. Here is one woman who is doing this and encouraging others who have also chosen to stand for their errant husbands. “You’re keeping your faith and your testimony is strong, even now. People want to fix the situation; it’s human nature. Most people default to fixing marriage problems by shifting the power from the errant spouse to the hurting spouse, by recommending the hurting spouse use divorce to top from the bottom (regain power and authority over the situation). “Human sympathy seems appropriate. I always ask people if they’re trying to be more sympathetic than God is merciful. Because that’s really what’s going on: people think that they care more than God does about the errant spouse AND the hurting spouse. ‘Fix this pain!’ cries the flesh. My friends often think I’m completely crazy, or that I must have zero respect for myself for remaining married with things the way they can be. “What they don’t realize is that they’re not going to be the ones picking up the pieces: they won’t be the ones loading up four children every few days to switch homes and clearing the emotional fallout from that. They won’t be paying to support my children or driving to medical appointments with me alone to help. They won’t be paying the lawyers or therapists; they won’t be training up my children to believe in covenant when they can’t even see it. They won’t be in my home holding babies for me. They won’t be at Court hearings fighting for my children to have stability in the midst of chaos. “Mable is in a marriage that is not meeting her expectations. She longs, dreams, and prays for her husband, Biff, to change. Biff has not changed, and it does not appear that he will ever change. “Mable is called to be obedient to her covenant relationship even in the face of not getting all she dreams from her marriage. Mable is called to follow Him who is invisible rather than pursuing her hopes and dreams that seem to be right in front of her (or sleeping beside her each night). “Are you willing to follow God, in obedience to God, even if you are not sure of or in control of the outcome? “Because Moses wanted Christ supremely, the temporary disappointments in his life did not control him. Moses had a long-sighted view into heaven, and it was that view that released him from the power that the things in his world could have held sway over him. “He saw Him, who was invisible. His eye was on the treasure. The treasure was Christ. That wealth is what ruled his heart. If your eye is steadfastly on Christ, your heart will not be controlled by the pleasures of this life, whatever they may be. Read 1 Peter over and over again and remind yourself how much Christ has suffered for you. Set your affection on things above, not on things on the earth. For ye are dead, and your life is hid with Christ in God (Colossians 3:2, 3). For this is thankworthy, if a man for conscience toward God endure grief, suffering wrongfully…but if, when ye do well, and suffer for it, ye take it patiently, this is acceptable with God. For even hereunto were ye called: because Christ also suffered for us, leaving us an example, that ye should follow His steps. Thanks a lot Lori once again for your daily reminder to think as God wants me to think, and not thinking like the world does. Thinking truth, liberty in Christ and grace, instead of temporary pleasure and claiming my rights… Thanks, and blessings!! 1. 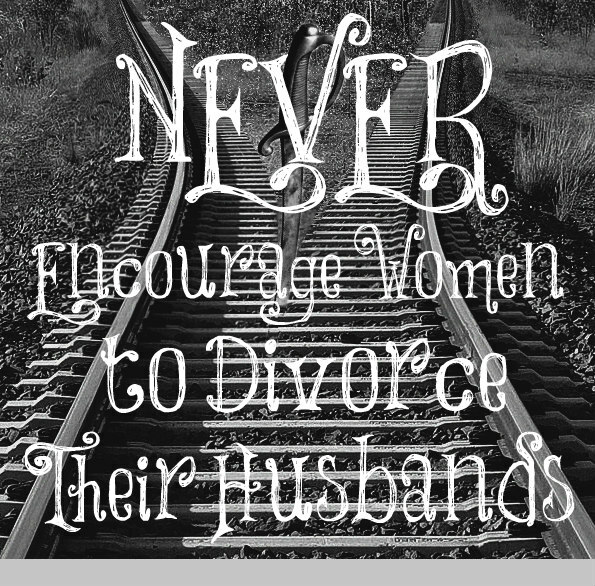 Amen: NEVER counsel that lie from Hell that one should divorce their spouse. Truth in God’s Word does not back up that counsel. 2. Amen: Start at the finish. At the finish line what do you want to see? That you were a quitter? That you took off your running shoes in an unfinished race, groaning and moaning about how your feet are blistered? Your side aches? That you ‘just can’t do this anymore’? I really liked that “skin in the game” phrase. God, my husband and I are the only ones who have skin in this marriage we started back in 1981. I know that God will never give up on this marriage, so hanging in there is something that my husband and I must choose for ourselves. As for us, we have never counseled each other with the S word (separate) or the D word (divorce) because ONCE YOU SAY THE WORDS, YOU GIVE THOSE WORDS LIFE. Words take on lives of their own! So, Lori, you’re right. Speak words of life if you have the opportunity to counsel a struggling spouse. With God, all things are possible. With Him, nothing shall be impossible. DON’T GIVE UP! Start at the finish! This was lovely. THANK YOU for sharing! I’ve shared with you previously, Lori, about how this happened in our family – the entire family, my husband and I included, unfortunately, encouraged my mother-in-law to divorce her husband due to his severe 40+ year drug addiction. THANK GOODNESS she didn’t take our advice. Today he is clean and sober and is the best grandpa in the world, their marriage is whole and intact, and we don’t have a heritage of broken promises and broken covenants to hand down to our children. No marriage is hopeless – unless it is killed purposely through divorce. It’s worth it to keep the faith, and I certainly learned my lesson about encouraging wives to leave bad marriages – I will never make that mistake again. That is so beautiful, Diana! Thank you for sharing. I will probably use some of your comment one of these days. My parents could have easily divorced but their blessings are full to overflowing because they stayed together and are now madly in love! Feel free, Lori! I can always write out the story for you if you ever need it. Thank you for all you do! I told my husband I was filing for divorce last night. I had myself convinced that I just couldn’t take another day. I hope you and Lori are right. It has been a long 15 years. I hope it turns around soon. Although I think he is a horrible husband, he seems to be willing to fight for this horrible marriage. Not in actions but, at least in words by saying he does not want a divorce. Of course, he thinks he is a perfect husband, and I am the entire problem. Perhaps it is just my pride that lets that attitude of his tear me up. This post brings me to tears as I have such a desire to see people stand for their marriages. Thank you a hundred times over for sharing this. My husband went to a therapist that told him to move on after 4 months of separation in a 18 year marriage because he shouldn’t “wait forever.” He, if coirse, didn’t tell me, his wife. Our son saw the dating apps on his phone and he is hooked up with a woman who is having her small child call him daddy after a 2 month relationship. Everyone tells me to move on, but I continue to stand. I just because that’s what’s in my heart and soul. You are doing the right thing, Judith. There are other women in your same situation who are standing for their marriages and trusting in the Lord for the outcome. Stay strong in Him and continue to do what He has called you to do.